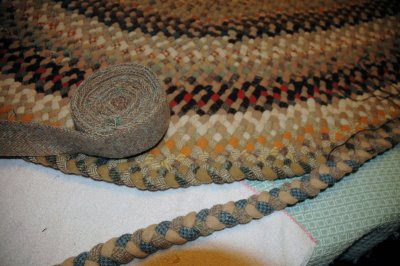 Bits of My Own: Just no hurrying this rug! 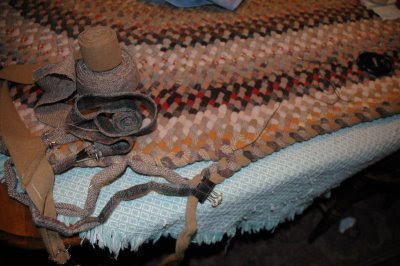 During the last few days I have spent quite a bit of time working on the rug. I have the sore neck, shoulders, and arms as well as the rough hands to prove it! It now measures about 70" X 115"
I was disappointed when I realized that it would not be done by Thanksgiving, but now reality has set in and I realize that it will not be finished by Christmas either! Bummer! It is just no fun having Christmas dinner on the coffee table! I just finished row 43 today. It takes 2 to 3 days for each row, and that doesn't count the time to prepare the wool. I figure I will need 58 or 59 rows. Very best case senario with no interuptions (ha ha) it would take me about 2 months to finish it. I just started row 44 today. This will be the last one in my medium shading. I am adding blue as my wild row. 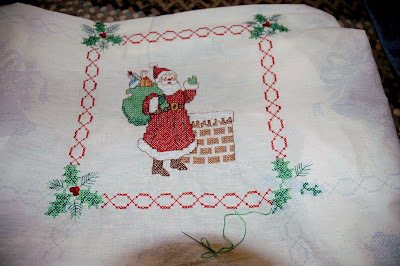 On the stitching front I have been working on the little lap quilt 'Tis the Season. I have almost finished one of the squares. I know this one will never be finished by the holidays! Oh well! Maybe by next Christmas I will be organized! 'tis the season square is looking great!! you can finish the rug, just don't eat or sleep. Sleep is over rated anyways LOL. Your lap quilt will be lovely!